We have had some of you request how you can get a copy of our hit song “My Name Is America” for Memorial Day. You can purchase a copy or download it at http://www.mynameisamerica.us. Here is the link to it on YouTube: https://www.youtube.com/watch?v=6TPgJSZf5Vw. We ALWAYS thank our past and present military for their sacrifice in protecting our freedoms! God Bless them! Our summer schedule will be starting just after Memorial weekend in Panama City BEach, FL. If you want to see our full calendar schedule please visit: www.toddallenshow.com. We are blessed to be back at Gulf World for our 12th season! Have you checked out our new mission for America? Visit: www.tentrevivalofamerica.org and check out all the comments folks are making about the events and see photos! 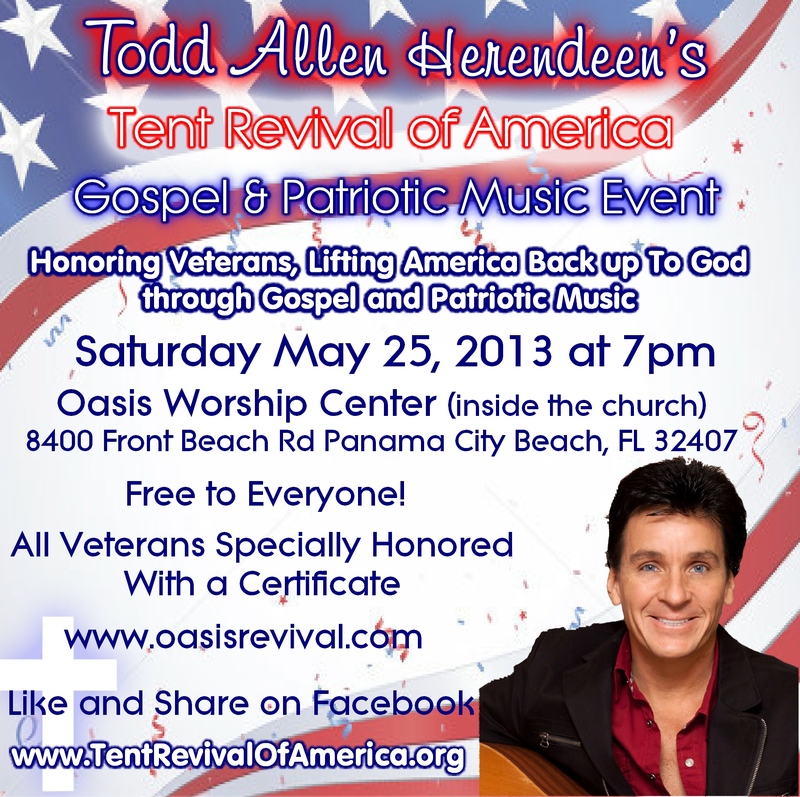 Speaking of which, we will be holding a special Tent Revival of America Music Event for Memorial Weekend in Panama City Beach, FL at Oasis Worship Center on May 25 at 7pm! Please join us for a great night of patriotic and gospel music and a special presentation to honor our veterans! Invite all the veterans you can as we are honoring each and every one with a special certificate! This concert is FREE to everyone! We have some exciting news coming soon about YOU being able to go on a cruise with US!! Of Course we would be doing some pretty awesome shows for you while we are on the boat! We’re thinking the date would be in January of 2014. More details on that coming soon! If you are interested in getting the info and cruising with Todd please send us a email at cruise@toddallenherendeen.com so we can email you back just as soon as we have all the details! Thank you so much for your support and interest in America and us.